A fascinating look at the monsters that ruled Eastern United States for almost a generation. It opens with scenes fro Sunday River's "Baltimore and Ohio" and closes with Archie Julian's "Battle for the Blue Ridge" It features-in spectacular sync sound-the last and most efficient Main Line articulated built in America, the B&O2-8-8-4 "Yellowstone" locomotives. See the rigid frame 2-6-6-6 A single 2-6-6-6-Allegheny of the Chesapeake & Ohio- the world most powerful steam locomotive- as well as the President Class 4-6-2s on the crack B&O limiteds, "Cinncinnatian" and Washingtonian". C&O Streamlined Hudson's haul "The Sportsman" and "The George Washington". A single 2-6-6-6 westbound from Covington with 100 loaded hoppers creeps to the summit at barely 5 MPH and in contrast, fast freights race thru White Sulfur and B&O articulated pound thru Confluence and New Castle. A definitive study of these powerful articulated engines! Joshua Beytien (Iowa) on 2018-02-13 02:44:52. 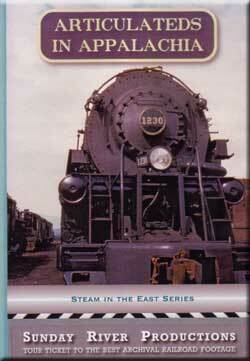 I find this video fascinating, especially the true sounds of the Chesapeake & Ohio's 2-6-6-6 Allegheny. Some of the music on the Norfolk and Western segment sounded more like a disco beat. I'd say in a disco rhythm; "Don't Give Up the Steam".